Whenever we try to achieve something great, there will be obstacles and tests on our path. Devotional service is no exception. We all get tested, and as we all know, maya hits us where we are the weakest. So what do we do, lay down and roll over? You might feel like it sometimes. In this newsletter we look at the how to understand and deal with the tests and obstacles that fall on our path to pure devotional service. And you know how well maya fights. She hits the hardest where you are weakest, where she finds your strongest material tendencies. We are only as strong as our weakest link – and she knows well where that is. So what’s the best way to fight with maya? Actually there’s no way we can directly win a fight with maya. Krnsa says, mama maya duratyaya, My material energy is insurmountable. She has a million tricks up her sleeve to illusion us and keep us away from Krsna. She’ll can convince us we are conquering her while we are fully in her clutches. But don’t get discouraged; she’s simply doing her job. This is all part of Krsna’s plan. Therefore it’s good. He wants us to suffer and struggle a bit because He knows it’s good for us spiritually lazy bums who want everything easy. Look at it this way: if anyone makes you take more shelter of Krsna, that person is your best friend. So if maya kicks you in such a way that it pushes you towards Krsna, she is doing you a great service. Maya is not your enemy. She is on your side. We all need struggles to keep us on our toes and strengthen us. Do you think you’d actually surrender much – or even at all – if maya didn’t kick you in the you know what from time to time? We need this. This is Krsna’s kindness on us. And another aspect of His kindness is that He helps us get through the tests. Do I Really Want Krsna? What are obstacles? Obstacles are things we focus on when we lose sight of our goals. Rupa Goswami, playing the part of a conditioned soul, shows us how we should be thinking. Rupa Goswami is saying I have no qualification to be Krsna conscious and thus it doesn’t seem possible that I’ll achieve my goal. And he even lists the reasons he is not qualified. 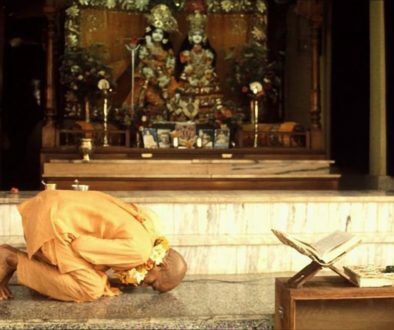 But his prayer doesn’t focus on those reasons; it focuses on his unrelenting desire to be Krsna conscious. Krsna wants to help us increase that intense greed. What happens when a child really wants something and the parents refuse to give it? Usually this just makes the child want it more. The tests Krsna places before you and me are meant to increase our determination. Prabhupada once said that Krsna will test you to see if you have come to serve Him or disturb Him. So as you confront difficult challenges, challenges in which you may be faltering, try seeing them as opportunities Krsna places before you. See Krsna behind these obstacles asking, “What’s important to you? Do you want Me or do you want something else?” See it as a chance to increase your determination and take another step towards Krsna. Well, if you asked Krsna what He had to say about that, He’d probably say, “Be like an ocean. The river of desires will enter, but the ocean is still. Be still My child.” The point is that a devotee who really wants to be Krsna conscious can live with obstacles and anarthas in his or her heart, not give into them, and be enthusiastic and determined in his or her service. “But I have a heavy mind. Prabhu, you don’t know how fallen I am, how conditioned I am. I have so many bad habits.” The devotee who wrote the following prayer also expresses a similar problem. But he deals with it in a wonderfully positive way. Of course we try our best to remove the weeds in our heart, but ultimately we are dependent on Krsna to purify us of those illicit desires. If you’ve ever lost your enthusiasm for devotional service because of the presence of unwanted desires that repeatedly surface in your heart, I suggest you copy the above prayer and keep it where you can regularly see it. This prayer offers us such a wonderful and liberating attitude: you can you be enthusiastic despite your anarthas. You can be hopeful of being Krsna conscious despite your shortcomings. You can you remain fully determined despite the many obstacles you face. Well, you can unless you listen to those little voices in your head telling you, “No you can’t.” Have those little voices ever made excuses for you not being Krsna conscious and then blamed them on your anarthas? If so, those little voices need to study that prayer over and over. 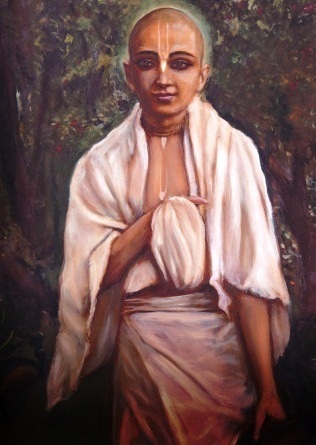 Srila Prabhupada taught that we can act in a Krsna conscious way despite our heart’s contrary desires. Maya’s tells us the exact opposite. 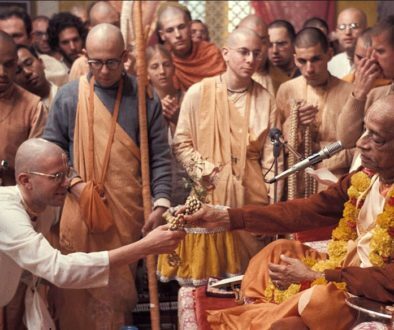 She wants us to believe that we have to give into our strong conditioning, that we are so fallen that even Krsna can’t help us overcome all of our conditioning. I suggest that you look at steadiness, enthusiasm, and determination to be Krsna conscious as an indication of your desire to be Krsna conscious, not necessarily as an indication of how pure you are. You might have to carry many anarthas with you throughout your life, but if you want to be Krsna conscious more than anything, those anarthas cannot and will not deter you. They will just make you more determined to be Krsna conscious. What are some things that are detrimental to your spiritual life that you give in to? What is giving in costing you materially and spiritually? 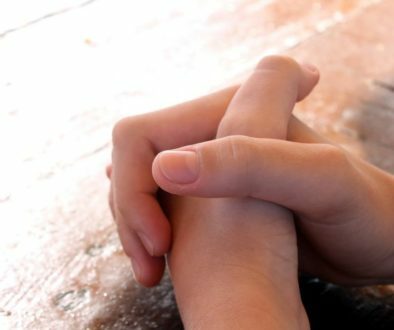 What is the belief behind giving in? What would you have to believe to not give in? If you find that your desire to be Krsna conscious is not strong enough to enable you to not give in all the time, what could you do to make it stronger?